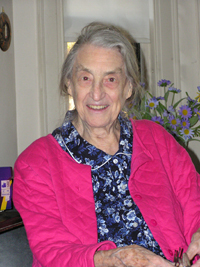 Dorrit Hoffleit's 77-year friendship with the AAVSO began in 1930. She was then just 23 years old, and listed her astronomical experience on her AAVSO application as "examining photographic plates to find and determine periods for variable stars." From the beginning of her involvement with variable stars and the AAVSO, and as her career turned through its very different phases over the decades, Dorrit was present at nearly every AAVSO annual meeting and many spring meetings. She visited AAVSO Headquarters at every opportunity — in her later years, these visits coincided not only with AAVSO meetings but also with trips from New Haven to her Boston dentist. We were sorry she had to visit the dentist but delighted for the chances to see her! 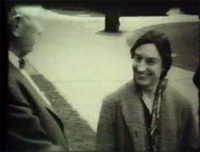 Among the hundreds of articles on astronomy published during her career, forty appeared in the Journal of the AAVSO in which Dorrit was the principal author. She presented papers at every AAVSO annual meeting she attended, but Dorrit is best remembered for bringing her Maria Mitchell Observatory summer research students to the annual meetings (from 1957 to 1978) to present the results of their summer's work in the form of a scientific paper — the first such experience for most of them. 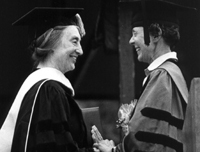 Dorrit served 8 two-year terms on the AAVSO Council: 1943-1945, 1954-1958, 1972-1974, 1977-1981, and 1989-1993. She also served an additional 7 years as an officer: 2nd Vice President 1958-1960, 1st Vice President 1960-1961, President 1961-1963, and Past President 1963-1965. Thus, she gave 23 years to the AAVSO in an official position of leadership. Over the years, she was often approached for her thoughts on a broad range of subject affecting the AAVSO, and she was a trusted advisor and mentor to many who were responsible for the AAVSO's well-being, particularly Janet Mattei. Dorrit's support of the AAVSO and its goals was also repeatedly demonstrated by her financial support (often anonymous). Numerous projects would not have been as successful as they were — or even possible — without her great generosity. Among the many reasons we had to be grateful for Dorrit's presence in the AAVSO, the most important was Dorrit herself. Her beaming smile and her wonderfully infectious laughter lightened the gloomiest day, her stories were fascinating, her breadth and depth of historical astronomical knowledge (and related fields such as astronomical politics) legendary, her wise counsel never ponderous or pompous. The example she set through the life she lived as her gracious, kind, practical self — often in the face of enormous adversity — was inspiring and enriching. When Dorrit turned 80, minor planet (3416) was named "Dorrit" in her honor. Dorrit said, "I like to joke that [my] asteroid is where I shall go when I die, my celestial home!" Perhaps Dorrit is now being welcomed at Dorrit (3416) by her celestial "AAVSO neighbors", including the residents of Cannonia (1120, Annie Jump Cannon), Swope (2168, Henrietta Swope), Fivesparks (3342, Margaret Mayall), SawyerHogg (2917, Helen Sawyer Hogg Priestley), Mattei (11695, Janet Mattei), and Marthahazen (10024, Martha Hazen). What a grand reunion for Dorrit and these good friends — the heavens must be ringing with their laughter!